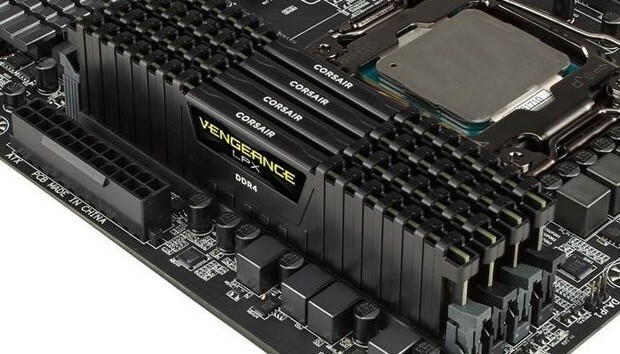 A mere week after G.Skill revealed a 128GB DDR4 memory kit clocked at a face-melting 3000MHz, Corsair’s launched a competing RAM kit that matches it gig-for-gig and clock-for-clock—but a pair of newly announced Corsair Vengeance LPX memory kits with less impressive capacities may actual steal their bigger brother’s thunder. Corsair’s no stranger to super-sized memory kits, of course—there’s a reason we went with Corsair’s Dominator Platinum line when we stuffed a PC with 128GB of cutting-edge DDR4 RAM. That gear was “only” clocked at 2400MHz, however; the company’s new Vengeance LPX DDR4 kit for quad-channel X99 motherboards hits 3000MHz with low CL16-18-18-36 CAS latency timings, spreading its 128GB of capacity across eight 16GB memory sticks. But Corsair’s other new memory kits are even faster, setting new records for the Vengeance LPX line. The Vengeance LPX 64GB (4x16GB) and 32GB (4x8GB) kits for dual-channel Z170 motherboards are clocked at 3333MHz and 3600MHz, respectively. To put that in proper context, the DDR3 memory found in the majority of PCs is typically clocked at 1600MHz or 1666MHz—less than half the speed of this new Corsair RAM. The 64GB kit features CL16-18-18-36 latency timings, while the faster 32GB kit rocks CL16-19-19-39 timings. Patriot and G.Skill have launched RAM clocked at 3600MHz in the past, but some quick Googling shows that those memory kits were limited to 8GB capacities. All three of Corsair’s new 1.35V Vengeance memory kits rock the signature Vengeance LPX heat spreader; the 128GB’s only available in black, while the lower capacities also offer red. All also support Intel’s XMP 2.0 memory overclocking technology. Look for Corsair’s blistering new memory kits to be available immediately, but be warned: This sort of performance doesn’t come cheap. The 32GB and 64GB kits will set you back $350 and $550, respectively, while the 128GB set costs an eye-watering $1,175. The impact on you at home: If you're a creative professional or video editor, turbocharged RAM can help you blow through your workload in less time, and that's swell. No average PC user needs memory like this in his home rig, however—but isn't it nice to dream?